One skillet meals can be a real time saver and can make clean up easier, too. It’s easy to modify traditional meat dishes into healthier vegetarian ones with a little practice and ingenuity. 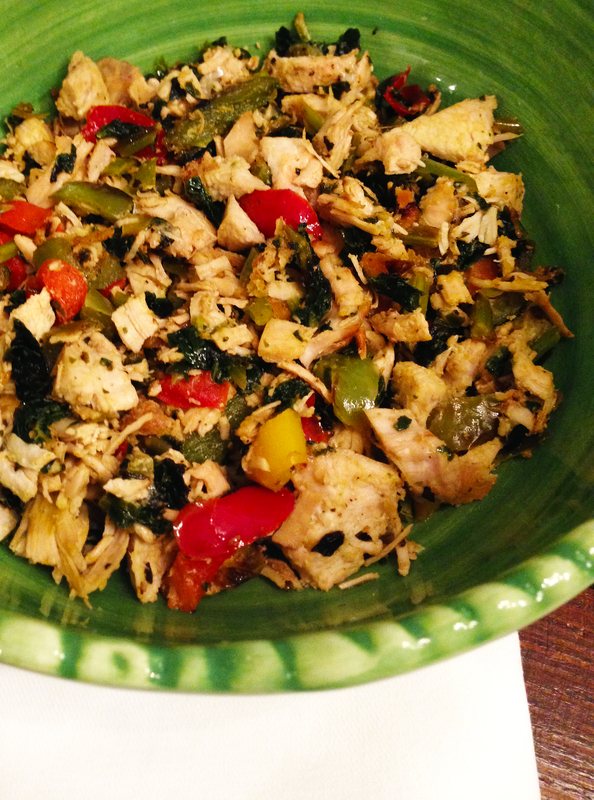 This Vegetarian Chicken, Kale, and 3 Pepper Skillet can be made with chicken, of course, but using tofu, gluten or tvp chunks, or even a bean will take this healthy choice into the very healthy world! Avoiding Meat? Try these alternatives! Protein concerns? These vegetarian sources can help! Though this is delicious as it is, there are many ways to jazz this up just a bit for a more special touch. You might add a touch of Worcestershire sauce (we use the vegan version) for a flavor zip, or stir in a little orange juice for a citrus kick. Serve it over a bed of rice or quinoa for a more filling meal that will serve lunch the next day, too. All of the ingredients listed can be purchased as organic products. We always choose organic whenever possible and urge you to consider doing so, as well. There are many reasons to choose organic, including the avoidance of GMO foods. A few of the top reasons are listed here. 1. Heat oil in large skillet. Add tofu or gluten and cook on medium heat until lightly browned, turning as needed. Remove tofu pieces, leaving oil in pan. 2. Add onions and peppers. Continue to saute until vegetables are softened. 3. Add mushrooms and kale. Sauté for approximately 3 minutes more, until kale is softened. Turn heat on low. 4. Add tofu to pan. Add a small amount of water or additional coconut oil, as needed. 5. Season with salt, garlic powder, and onion powder. Stir well. until cheese is evenly distributed. Sounds delicious! One-pan meals are ALWAYS my go-to (mostly because I never figured out how to have multiple dishes ready and hot at the same time! ), so I will have to give this a try. Thanks for sharing! I LOVE one pan meals! I am adding this to my file. It has a small list of ingredients and includes things we like to eat! I was pondering what to have for dinner tonight. This is an excellent choice. Your photo just makes it look so appealing.